If you've never stayed in a tramping hut, walking into the wilderness on the way to a hut can feel like a leap of faith. Here's how to get started. The New Zealand Department of Conservation owns or manages nearly 1000 backcountry huts available for public use. These huts range from basic to relative luxury. Some are purpose built, while others have a long history of use by musterers, deer cullers, or even lighthouse keepers. The smallest huts are known as "bivs" and may be so small you can't stand up in them. DOC huts are there for you to use. Many huts are also owned by clubs, and these are often also open to the public. Choose a hut nearby, not too far from the road. Here are some suggestions to get you started. There are not a lot of huts around Auckland and they are in high demand, so you will need to book them. Peach Cove Hut, Pinnacles Hut (Coromandel Peninsula), Waitawheta Hut. The Orongorongo Valley near Wellington has a number of huts available. These need to be booked, and offer a lot of home comforts. Try these: Boar Inn, Raukawa Lodge, Oaks Hut, Jans Hut, Turere Lodge, Haurangi Hut. Huts near Christchurch include Sign of the Packhorse on Banks Peninsula or huts across the plains: Pinchgut Hut, Woolshed Creek Hut, Bealey Hut, Hawdon Hut, Benmore Hut. WoolShed Creek Hut • By SandraM. 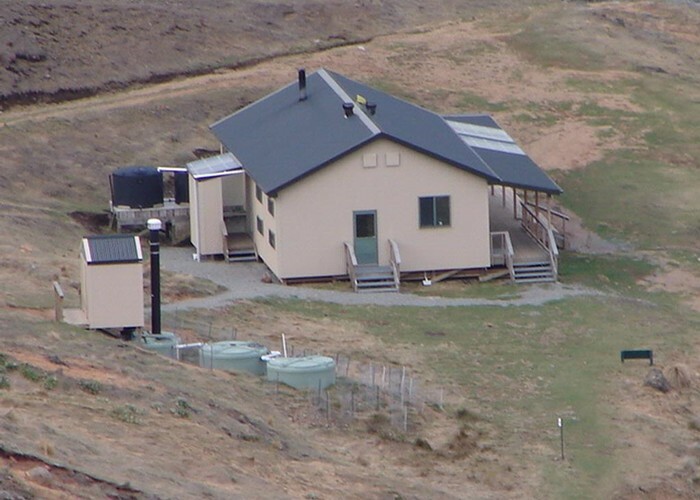 Huts near Dunedin include Jubilee Hut, Leaning Lodge, Big Hut. A typical hut will have some form of water supply, a wood burner, a long drop toilet outside, a cooking area with a table and bench seats, and bunks or sleeping platforms with mattresses. Don't expect food available for purchase, rubbish facilities, cookers or cookware, hot water, showers, lighting, electricity, or toilet paper! How do I book or pay? All huts on the Great Walks (9 premium routes) must be booked in advance. Some other high-occupancy huts and also sole-occupancy huts must also be booked. Huts may be booked online (see the link below). Other DOC huts fall into the following categories: basic, standard, serviced, and serviced alpine. Basic huts are free of charge. Standard huts require one hut ticket, and serviced huts require 3 (different rates apply for children). Hut tickets are not specific to a hut -- you can buy them in advance and use them as you go. You can also purchase an annual hut pass, which can be used instead of tickets. Hut passes are more useful in the South Island. Serviced alpine huts have higher fees due to the challenges of alpine environments. These are paid for at nearby DOC offices. Some Great Walks have an off season, where huts are paid for using hut tickets or a pass. However, the track itself may be impassible at these times of year. Great Walks: Adults $22-$54 / night. Youths (11-17), children (5-10), and infants (0-4) free. Serviced huts: Adults $15 / night. Youths $7.50 / night. Children and infants free. Standard huts: Adults $5 / night. Youths $2.50 / night. Children and infants free. Prices for club huts are often similar, but need to be checked in advance with the club. For most huts, you need to take everything you will need for the night. This includes food, a plastic water bottle, a cooker and lighter, a pot, a bowl, a spoon, a sharp knife, a torch, a sleeping bag, earplugs, toilet paper, toothbrush, small bottle of hand sanitiser, small first aid kit. Things you don't need to take are pillows, sheets, and mattresses. If you don't have a cooker, just take food you can eat cold. Do take layers of warm clothes. Your hut may not be as warm as you would like. Remember that you need to carry out what you carry in. There is no rubbish displosal at huts. What kind of food should I take? Take something that cooks quickly in one pot. Avoid carrying food that contains a lot of water as it is heavy to carry. Quick cooking pasta, couscous, TVP, and dehydrated food is be useful. A little prepared bag of herbs or spices can be useful and the weight is negligible. Make sure you have food you can eat without cooking, just in case. For breakfast, oats or muesli works well. Dried fruit soaked overnight will reconstitute well. You can keep things simple by packing muesli bars. In general, if you want to get away from other people, huts may not be for you. Be prepared to share and make room. 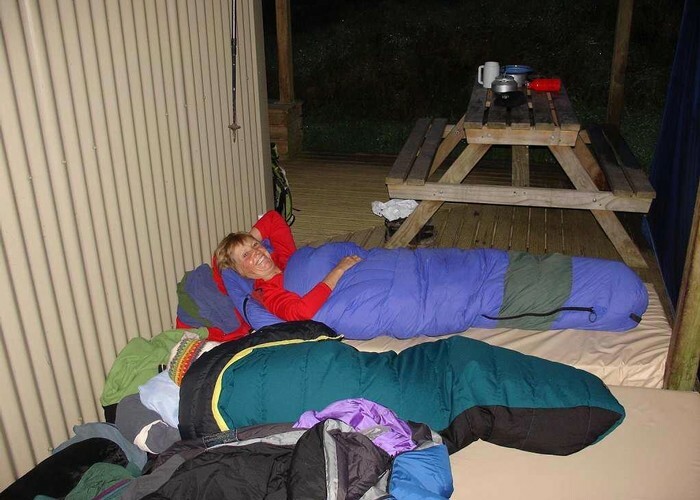 In general, you can find a corner to get changed or just use your sleeping bag for privacy. What if the hut is full? Unless it is a booked hut, nobody has the right to turn you away from a hut, but you may be sleeping on the floor! If this concerns you, then you should choose a hut you can book, avoid weekends, arrive early, or take an inflatable hiking mattress. The Best Bunkrook at Waitawheta Hut • By pmcke. Most but not all huts are shared-occupancy. If you would like a sole occupancy hut, check the DOC booking form. Out of courtesy for others, share the space, make room for late arrivals, and keep your gear tidy. Remember that different parties have different schedules. If you are setting off early or if you are staying up late, keep the noise down. A few huts are sole-occupancy. When you book the hut you get a key and private use. Away from the major huts and tracks, it's a good idea to carry a tent in case you don't make your destination, the hut is full, or you want to change your plans. Absolutely. Kids have every right to use huts. Just be considerate of other hut users and aware of hazards such as gas cookers and wood burners. It pays to think about activities that can keep them busy in the hut. Hut books are there to record your plans for safety purposes, and to share information. Talk about routes, weather, issues with the hut, what ever you like. Just respect the book. In older huts, it's a good idea to hang your food out of the reach of mice. Water supplies are not necessarily free of disease. If in doubt, boil or treat your water. If the water supply comes from the roof or a forest stream, you're probably safe. Carbon monoxide can be a killer in smaller well-sealed huts. Keep a window open for ventilation while cooking. Finally, fire is an obvious risk. Cook on metal benches where possible, away from flammable items. What is the hut etiquette? Huts are often small, with a lot of pressure on limited space for cooking. 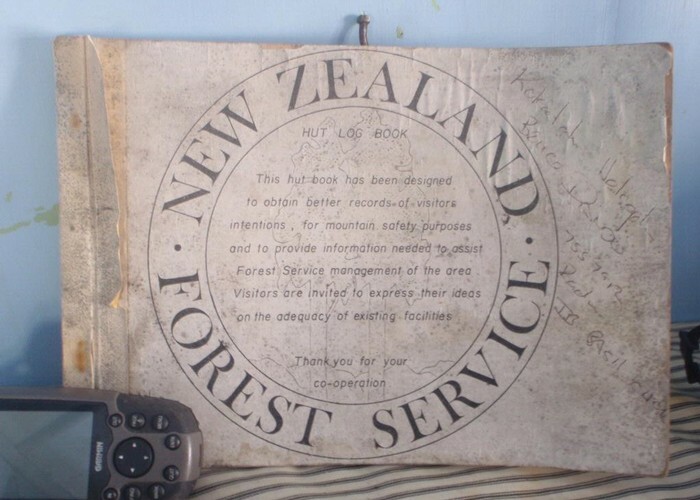 NZ Forest Service hut book • By lewshaw. Licence: cc by-nc. Keep things tidy and allow room for others. Fill in the hut book. Don't touch other people's things. Don't act like you own the place because you have a big group or you got there first. Keep quiet when people are trying to sleep. That includes mornings: it's not your decision when everybody should get up. Don't leave food scattered around as it encourages pests. Give the hut a sweep and wipe when you leave. Don't put rubbish in the fire or the toilet. Restock wood supplies, but don't cut living trees. Carry all your rubbish out with you. You are ready to visit a hut. Still not sure? Choose one that is 2-3 hours from the road and make it a day walk. Check it out and come back with your sleeping bag! As always, if you haven't been tramping before, you are best to start off with day walks, on the Great Walks, join a club, or to go with an experienced tramper. Huts - further information on the history and culture of huts. Hut Bagger - track the huts you've visited! Added 6 July 2014 by MatthewMatthew. 1 revision 25 August 2015 by MatthewMatthew. 751 views in the past year (63 per month).